Nitric oxide (NO) is a small free radical generated by a family of enzymes, the nitric oxide synthases (NOSs). Following injury to a tendon, NO is induced by all three isoforms of NOS and NOS activity is also upregulated in tendinopathy. In animal models when NOS activity is inhibited by competitive inhibitors of NOS, tendon healing is reduced. When additional NO is added, tendon healing is enhanced. In humans, in three randomised clinical trials, we have shown that NO delivered via a transdermal patch enhances the subjective and objective recovery of patients with tennis elbow, Achilles tendinosis and supraspinatus tendinosis. Nitric oxide (NO) is a small soluble gas synthesised by a family of enzymes, the nitric oxide synthases (NOSs). Like other free radicals, in large doses NO is toxic. In smaller, physiological doses, however, it acts as a messenger molecule. In an exercise overuse model of tendon degeneration in the rat,9,10 we found that iNOS, eNOS and bNOS mRNAs were overexpressed in the supraspinatus tendon of rats subjected to treadmill running at 14 days.11 These results suggest that NOS activity is induced as a result of tendon injury in this model, and/or that expression of NOS is a part of supraspinatus tendinopathy. During surgical repair of the rotator cuff in humans, the edges of the torn tendon are excised and discarded. We have evaluated these samples and found that NOS enzyme activity was detectable in 7 of 10 human rotator cuff tendon samples. mRNA expression was demonstrated for iNOS and eNOS isoforms in each sample examined, whereas bNOS mRNA was detectable in 3 of 8 samples.12 These results indicate that a similar phenomenon of NOS upregulation following injury occurs in humans as in rats. WHERE DOES NO COME FROM? IS NOS EXPRESSION IMPORTANT TO TENDON HEALING? WHAT ROLES DOES NO PLAY IN TENDON HEALING? The experiments on animals using NOS inhibitors show that NO is important for the volume of tissue synthesised during tendon healing (fig 1). NO is likely to be important in a number of processes, including local blood flow and host defence. Work in our laboratory has identified NO to be important in collagen synthesis.14 Cultured human rotator cuff tendon cells, when exposed to exogenous NO in the form of S-nitro-N-acetyl penicillamine and when transfected with the iNOS gene via an adenovirus vector, incorporated more collagenase-sensitive 3H-proline in their matrix. This increased collagen synthesis was inhibited by an NOS inhibitor. Schematic diagram of the overall effects of the addition and inhibition of nitric oxide (NO) on tendon healing. In our rat model, we delivered NO via flurbiprofen, a non-specific cyclo-oxygenase inhibitor and via NO-paracetamol. In both experiments, the addition of NO had a protective or beneficial effect on collagen organisation, tendon healing failure load and stress (load/area).16,17 These rat results are consistent with cell culture findings for human tendon cells where NO enhanced collagen synthesis, and with the results from the clinical trials described below. Application of a glyceryl trinitrate (GTN) patch to the shoulder for supraspinatus tendinosis. Dr Eugene Heyman completed an independent reanalysis of the data from the three studies. In this analysis any missing data, whenever it occurred, were filled in by carrying forward the last value. Each analysis was adjusted for the baseline value. For categorical data with responses of 0–4, the baseline value was treated as a block—that is, all the patients with a baseline value of 0 were grouped together, those with a baseline of 1 were grouped together and so on. The mean results were then compared between treatment groups within each baseline score and then the treatment differences were averaged while using the total number of patients within the baseline category to weight the results. Patients within the same baseline score were treated the same, but the treatment differences were weighted by the total number of patients within that baseline score. For continuous data (eg, total work), the change from baseline was used and then included as a covariate to account for any baseline differences and to account for the relationship between the baseline and the change from baseline. When patients with bilateral data were identified, the data were analysed in three ways. First, the results from the two sides were averaged, then, all bilateral patients were excluded. Finally, each group was treated separately. Tables 1–4 presents the results. This study, involving three clinical trials, showed that delivering nitric oxide via a patch enhances clinical recovery of tendinopathy in humans. The enhancement is manifested by a reduction in pain, an increase in range of motion and an increase in strength. Nitric oxide (NO) is important to tendon healing. Nitric oxide synthase (NOS) activity is upregulated in tendinopathy. In animal models where NOS activity is inhibited, tendon healing is reduced. When additional NO is added, tendon healing is enhanced. Supraspinatus tendinosis. 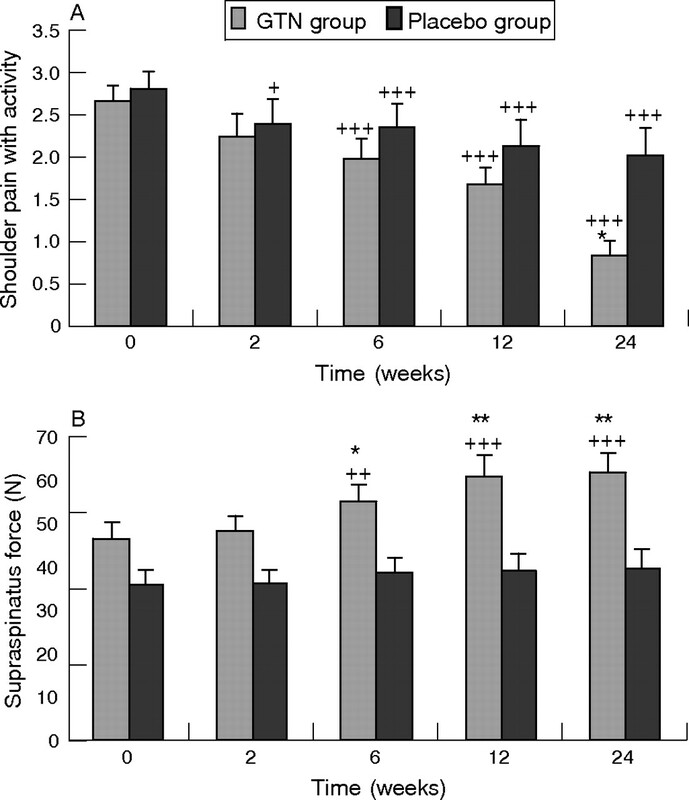 Effects of glyceryl trinitrate (GTN, n = 28) 1.25 mg/d via transdermal patch versus rehabilitation alone (placebo, n = 29) on shoulder pain with activities (A) and on dynamometer-measured supraspinatus force (B); a between-groups comparison of means and the standard error of the mean. Significant differences: *p<0.05, **p<0.01. ++p<0.01, +++p<0.001 compared with baseline using student’s paired t tests. (Adapted from Paoloni et al20). NO is important to tendon healing. All three isoforms of NOS, the enzyme that produces NO, are expressed by fibroblasts during tendon healing. Our data in animal studies, cell culture and clinical trials support the hypothesis that NO enhances extracellular matrix synthesis and results in injured tendons having better material and mechanical properties—that is, the healing tendons are stronger on a per unit area basis than those not exposed to additional NO. The clinical trials show that delivering NO via a patch enhances the clinical recovery of tendinopathy, which is manifested by a reduction in pain, an increase in range of motion and an increase in strength. I thank the following for their invaluable contributions: Tom Best, Allison Collins, Ed Lilly, Anthony Seaber, Richard Goldner, Kim Hayes, Judie Walton, Zoltan Szomor, Jian-Hao Lin, Min Wang, Ai Wei, Wei Zhu, Ashish Diwan, Danny Jang, Xian-Hao Deng, Jo Hannafin, Helen Davies, Marty Dolan, Dedee Murrell, Richard Appleyard, Janice Nelson, Fiona Bonar, Gong-Yao Tang, Jun Yuan, Piero Del Soldato, Wei Zhu, Wei Xia, Yao Wang, Denis King, James Urbaniak, Martin Francis, Robert Duthie, Ed Puzas, Charles Turner, Chris Evans, Bruce Caterson, Csaba Szabo, Laura Manfield, Justin Paoloni, Tim Molloy, Eugene Heyman, Robert Ang, National Institutes of Health Grant AR42729 (GACM), the Soft Tissue Research Fund, Piedmont Foundation, Orthopaedic Research and Education Foundation (OREF), St George Private Hospital/Health Care of Australia and St George Hospital/South East Health, and NiCOX Corporation and Cure Therapeutics. Palmer RMJ, Ashton DS, Moncada S. Vascular endothelial cells synthesize nitric oxide from L-arginine. Nature1988;333:664–6. Bredt DS, Hwang PM, Snyder SH. Localization of nitric oxide synthase indicating a neural role for nitric oxide. Nature1990;347:768–70. Stuehr DJ, Nathan CF. Nitric oxide: a macrophage product responsible for cytostasis and respiratory inhibition in tumor target cells. J Exp Med1989;169:1543–55. Xie QW, Cho HJ, Calaycay J, et al. Cloning and characterization of inducible nitric oxide synthase from mouse macrophages. Science 1992;256:225–8. Murrell GAC, Szabo C, Hannafin JA, et al. Modulation of tendon healing by nitric oxide. Inflamm Res 1997;46:19–27. Lin J-H, Wang M-X, Wei A, et al. Temporal expression of nitric oxide synthase isoforms in healing Achilles tendon. J Orthop Res 2001;19:136–42. Lin J-H, Wang M-X, Wei A, et al. The cell specific temporal expression of nitric oxide synthase isoforms during Achilles tendon healing. Inflamm Res 2001;50:1–8. Szomor ZL. Nitric oxide in rotator cuff tendon [PhD thesis]. Sydney: University of New South Wales, 2003. Carpenter JE, Flanagan CL, Thomopoulos S, et al. The effects of overuse combined with intrinsic or extrinsic alterations in an animal model of rotator cuff tendinosis. Am J Sports Med 1998;26:801–7. Carpenter JE, Thomopoulos S, Flanagan CL, et al. Rotator cuff defect healing: a biomechanical and histologic analysis in an animal model. J Shoulder Elbow Surg 1998;7:599–605. Szomor Z, Appleyard RA, Murrell GAC. Overexpression of nitric oxide synthases in tendon overuse. 49th Annual Meeting of the Orthopaedic Research Society. New Orleans, LA 2003:146. Szomor ZL, Wang MX, Kruller A, et al. Differential expression of cytokines and nitric oxide synthase expression in human rotator cuff bursae. Ann Rheum Dis 2001;60:431–2. Xia W, Wang Y, Appleyard R, et al. Achilles tendon healing in iNOS knockout mice. 49th Annual Meeting of the Orthopaedic Research Society, New Orleans, LA. 2003:824. Xia W, Szomor Z, Wang Y, et al. Nitric oxide enhances collagen synthesis in cultured human tendon cells. J Orthop Res 2006;24:159–72. Molloy TJ, de Bock C, Wang Y, et al. Gene expression changes in SNAP-stimulated and iNOS-transfected tenocytes—expression of extracellular matrix genes and its implications for tendon healing. J Orthop Res 2006;24:1869–82. Tang GY, Murrell GAC, Yuan J, et al. Addition of NO via NO-paracetamol enhances collagen content and organization of healing rat Achilles tendon. Proceedings of the 50th Annual Meeting of the Orthopaedic Research Society, New Orleans, LA. 2004:876. Yuan J, Murrell GAC, Wei AQ, et al. Addition of nitric oxide via nitroflurbiprofen enhances the material properties of healing Achilles tendon. Inflamm Res 2003;52:230–7. Paoloni J, Appleyard R, Murrell GAC. A randomized double-blind placebo controlled clinical trial investigating the use of topical nitric oxide application in the treatment of Achilles tendonitis. J Bone and Joint Surg (Am)2004;86-A:916–22. Paoloni JA, Appleyard RC, Nelson J, et al. Topical nitric oxide application in the treatment of chronic extensor tendinosis at the elbow: a randomized, double-blinded, placebo-controlled clinical trial. Am J Sports Med 2003;31:915–20. Paoloni JA, Appleyard RC, Nelson J, et al. Topical glyceryl trinitrate application in the treatment of chronic supraspinatus tendinopathy: a randomized, double-blinded, placebo-controlled clinical trial. Am J Sports Med 2005;33:806–13.